I spent much of my childhood making art and my first degree was in design, specialising in typography. Beginning in corporate design, I moved (via Masters’ degrees in Marketing and Responsibility and Business Practice), to business consultancy, action research and sustainability. I then came to weave arts-based practice back into the mainstream of my work. My involvement with sustainability issues brought to the fore the need for our species, to come to know the world in many different ways – including “presentational knowing” or arts-based practice. Increasingly, I have worked in the visual arts, improvisation, storytelling, clowning and forum theatre (in Sri Lanka) in my educational, business and development work. I am a Visiting Fellow at the Centre for Action Research in Professional Practice, and my consultancy work is deeply informed by and concerned with action research processes. This interweaving of my concerns was articulated in my unconventional 2006 PhD – “Wild Margins: Playing at work and life” which explores the overlapping relationship between purposeful work and the arts, and arts-based practice (especially clowning) which holds intentions around sustainability issues. 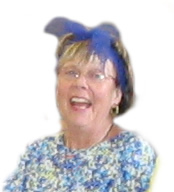 In memory of Jackie Moore who died 31 July 2006 Jackie Moore worked mostly in collaboration with Dr. David McGavin at the Blackthorn Trust Medical Centre in Maidstone where she inspired many to start clowning. She excelled particularly in performance and was already fooling around and jestering well before she trained to teach clowning formally with Nose to Nose. Her perception and understanding of how people relate to each other gave her performances a clarity and truth that people recognized and loved. Last year, Jackie had started collaborating with Paul MacDonald on an autobiographical one-woman clown show. 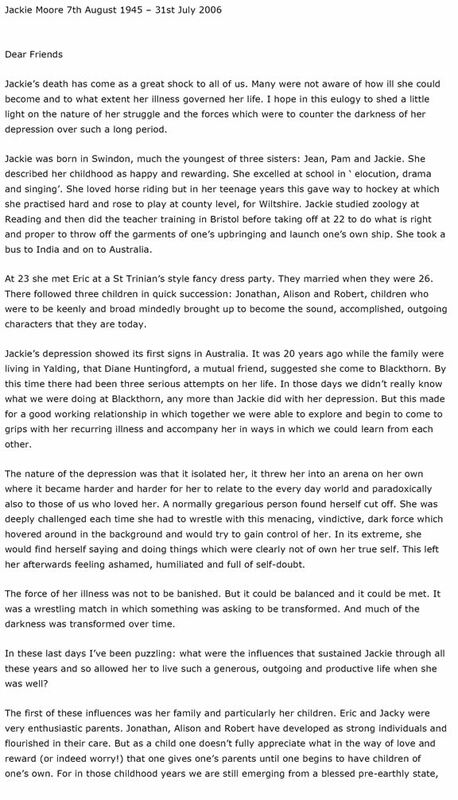 Below is Dr. David McGavin’s address at Jackie Moore’s funeral. Last year, Jackie had started collaborating with Paul MacDonald on an autobiographical one-woman clown show. 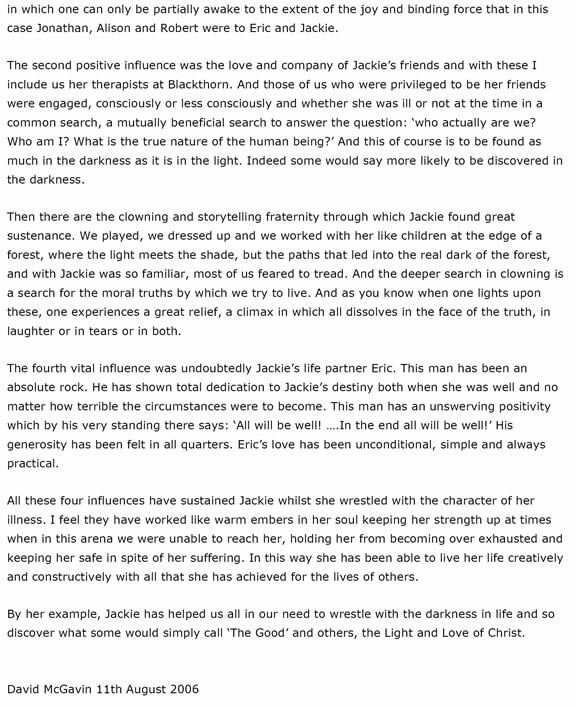 Below is Dr. David McGavin’s address at Jackie Moore’s funeral.